FREE INTERNATIONAL SHIPPING FOR ORDERS ABOVE $200! Inonotus obliquus, also known as Chaga, is a parasitic fungus that grows on living trees in uber cold, circumpolar, deciduous forests. 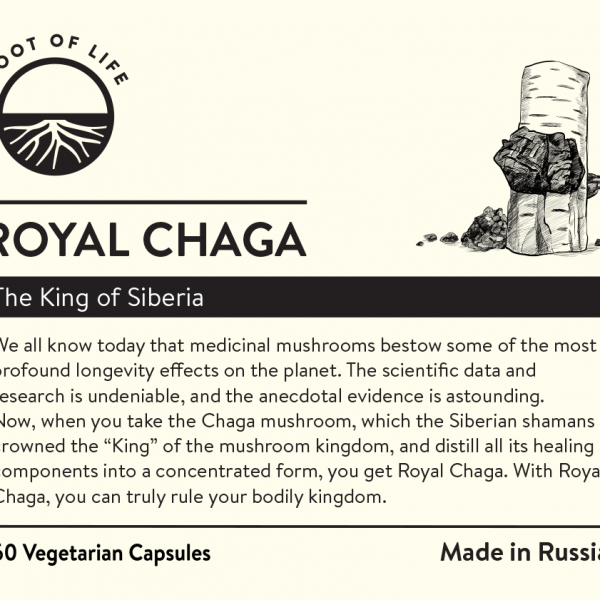 In Siberian folklore, Chaga is considered the “King of the Mushrooms” and is regarded as a miracle herb by indigenous Siberians. Inonotus obliquus, also known as chaga, is a parasitic fungus that grows on living trees, especially the birch tree, in uber cold, circumpolar, deciduous forests. 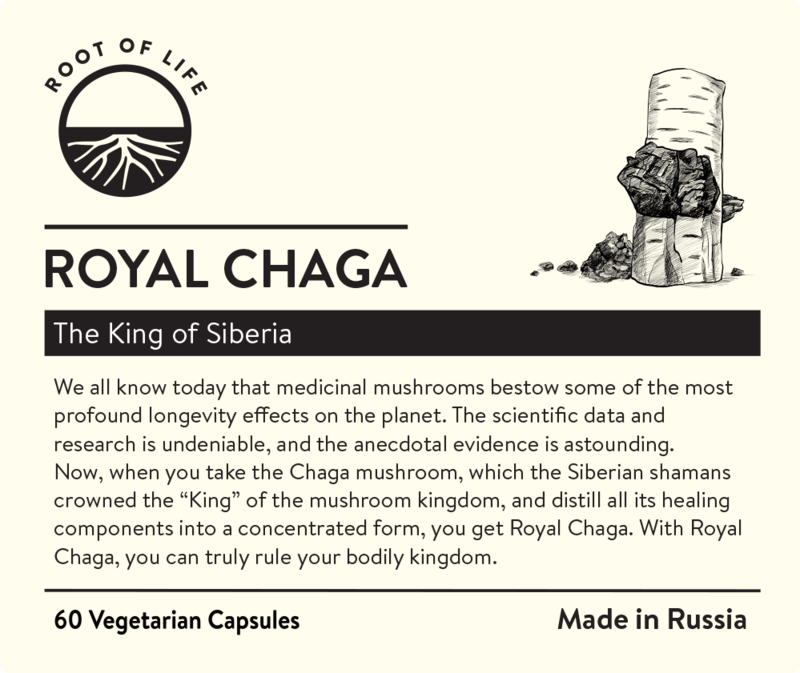 In Siberian folklore, chaga is considered the “King of the Mushrooms.” In fact, it is regarded as a miracle herb by indigenous Siberians. Records demonstrate use of chaga by Russians for at least 600 years, and definitely much longer off-record. Chaga was listed in the earliest text on Chinese medicine: the fabled Shennong Ben Cao Jing. It is known to nourish/tonify Jing and Shen i.e. represented by kidney and heart. Lingzhi, or Reishi mushroom, which is highly prized and revered in Asia as a medicinal mushroom, is regarded as the queen. Before we detail the immense benefits of consuming chaga, it is first imperative to understand that medicinal mushrooms and many edible mushrooms are some of the best foods and support for the immune system. Alexander Solzhenitsyn, Nobel Laureate author of The Cancer Ward, survived cancer by choosing chemotherapy with chaga. The doctor mentioned in his book worked for decades in the same hospital he was in and made a profound observation – that peasants in his district saved money on tea and brewed birch fungus, or rather, chaga tea instead. These peasants NEVER got cancer and would live to over 100. 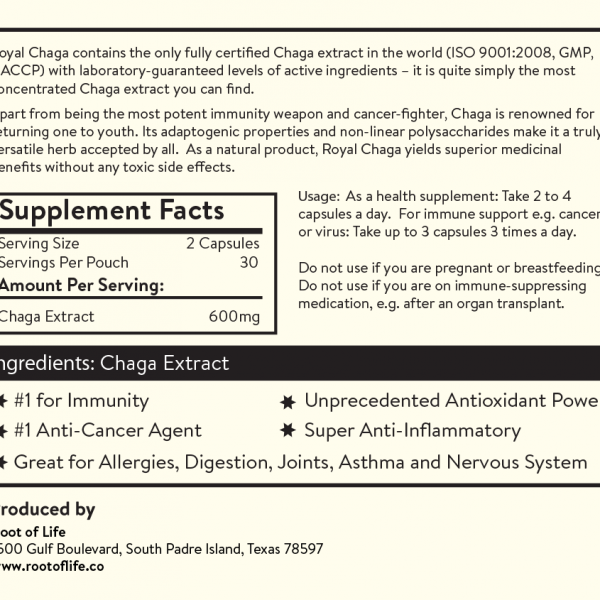 However, there are a few chaga products on the market which are riding on this wave. As chaga is still very new to the mainstream world, even established companies do not immediately understand the correct ways of treating, extracting and processing chaga in a way that releases its active components. Worse still, we don’t even know their hygiene standards. While there may be some products that do contain quality, aged, wild chaga, their lack of know-how in extracting it might result in “wastage”. Without extracting the water-soluble and alcohol- soluble components and breaking down the hard cell walls of chaga i.e. chitin, the product might not offer the benefits desired. Royal Chaga contains the only fully certified Chaga extract in the world (ISO 22000:2005, GMP, HACCP), with laboratory-guaranteed levels of active ingredients. It is the only Chaga product that guarantees at LEAST 50% Polysaccharides and 1.5% Betulinic Acid (backed by Certificates of Analyses), making it the MOST concentrated Chaga supplement. 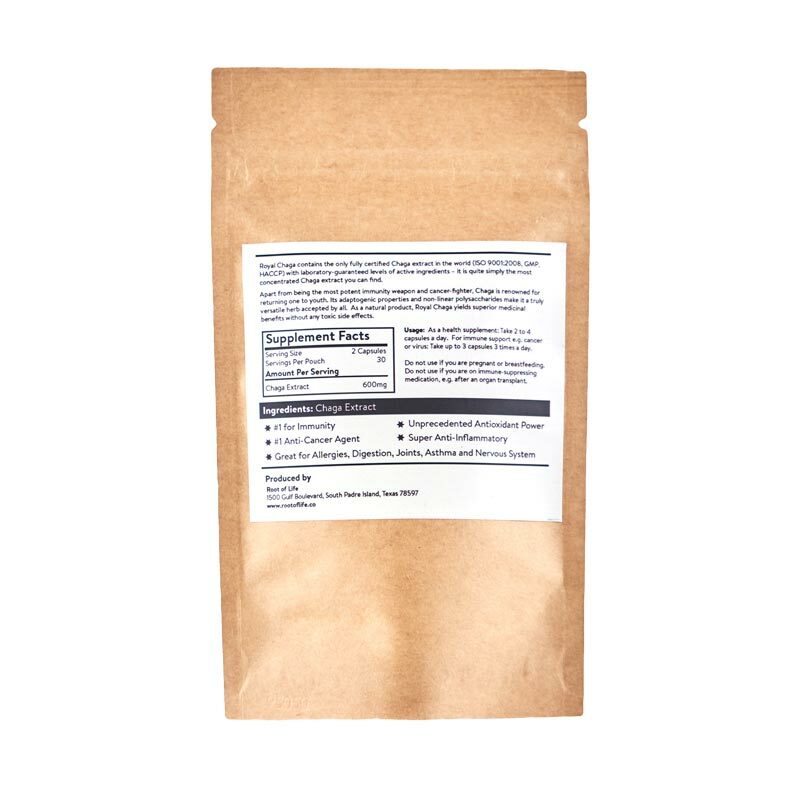 Raw or unintelligently extracted mushroom powders contain none or insufficient levels of the polysaccharides, phytosterols, triterpines, saponins and polyphenolics associated with Chaga, the #1 herb in the world. 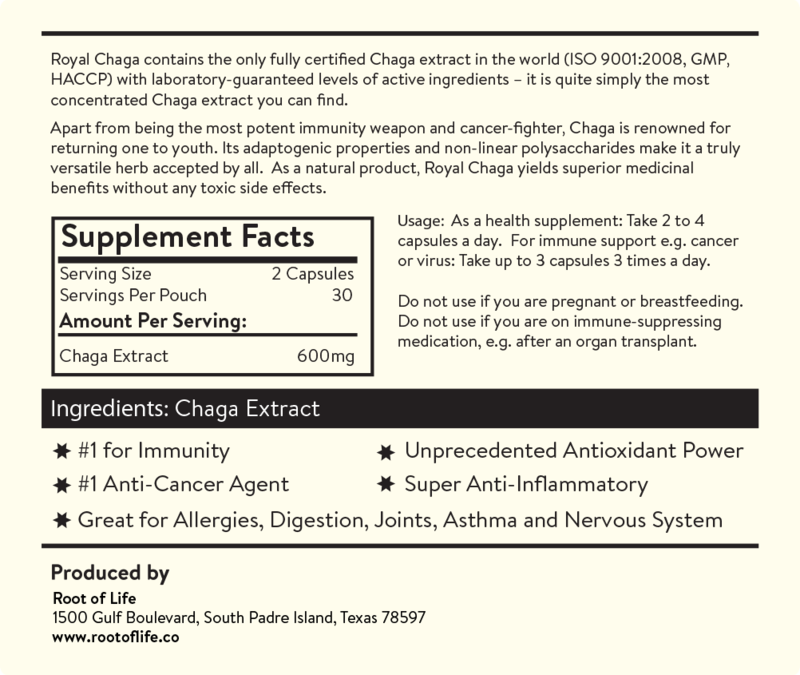 Royal Chaga also has the highest ORAC value ever measured in a Chaga product. There is simply no comparison. Directions: For long-term support, take 2-4 capsules a day. For cancer or viral infection support, take up to 3 capsules 3 times a day or consult your designated health practitioner for advice. Do not use if you are on immune-suppressing medication e.g. after an organ transplant. Antioxidants: Chaga is second only to cacao in antioxidants of any whole food or herb in the world (above the highly touted resveratrol, maqui and acai berry). Contains DBL (3,4- dihydroxybenzaldehyde), inonotusin A and B, and SOD. DBL has shown to inhibit NF-kB activation and NF-kB-regulated gene expression, thereby lowering inflammation and inhibiting cancer growth. Non-Linear Polysaccharides (Beta Glucans, Protein-Bound Xylogalactoglucans etc. ): These are quite literally, the healthiest food to feed your white blood cells. Unlike one-directional immune “boosters” that upregulate the immune system, polysaccharides like the renowned and well-researched beta glucans, are immunomodulating. This means that they help to BOOST the immune system when it is UNDER-active e.g. in the case of viruses, cancer, and help to CALM it down when it is OVER-active i.e. in the case of auto-immune disorders such as Rheumatoid Arthritis, Lupus, Multiple Sclerosis … so that the immune system can also stop attacking healthy cells and focus on/be aware of more pressing matters like cancer. Immunity intelligence allows the body to react in the most appropriate way in the most appropriate time – which is the true art of medicine. Beta glucans also have cytotoxic properties that kill certain cancer cells directly. These polysaccharides in all also help repair the gut and provide joint relief and support. Superoxide Dismutase (SOD): This is one of the most powerful healing and detoxification enzymes in the world and aids the liver immensely. It is an endogenous antioxidant, which functions INSIDE the cell where it matters most. Chaga, if extracted correctly, has one of the highest known sources of SOD in any natural botanical or herb known to man. Melanin: This fights radiation and activates the pineal gland. 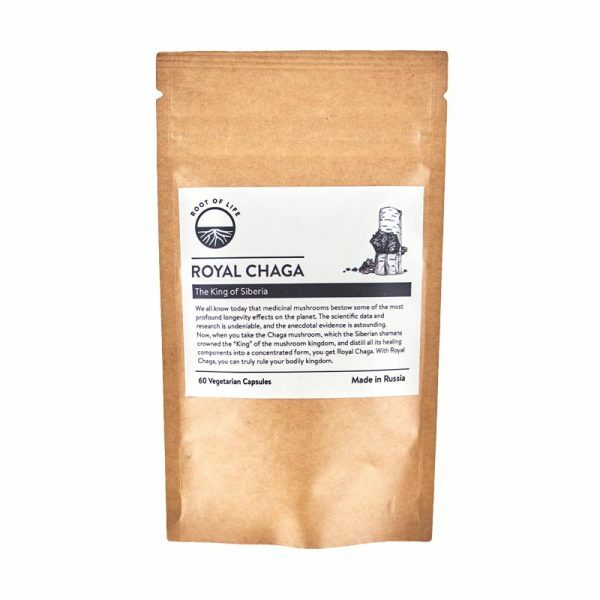 Chaga is the best source of this nutrient found in nature and thus is the best way to get rid of radioactive substances in the body (thereby protecting the thyroid and the body), and to enhance spiritual practice and psychic development. 25% of its pigments are melanin (VS only 2% with Reishi/Lingzhi) which also nourishes the skin and hair. Chaga is thus great for Shen development and for anyone who wants to detoxify their body of radiation therapy, seafood containing radioactive isotopes e.g. Iodine-131 and much more. Triterpenes: These are amazing medicinal saponin compounds that help your immune system fight viruses and cancer, of which inotodiol found in chaga seems to be most active and strongly inhibits cancer cell proliferation. Also, they exhibit strong adaptogenic properties, which is all about giving the body an intelligence to fight stress and adapt to various environmental conditions/changes. Betulin, Betulinic Acid, Lupeol: These are chaga’s most powerful healing agents and may be the most powerful medicinal healing compounds produced in nature. Out of 2,500 botanical substances reviewed for their power to fight cancer, betulin is number one and highly concentrated in chaga from the birch tree – proven to DIRECTLY target cancer with its anti-tumour and anti-mutagenic properties. 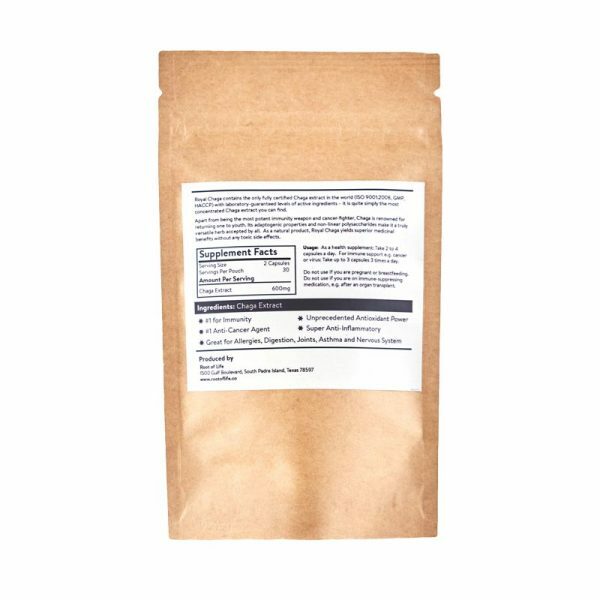 ORMUS: Found in the polysaccharides of chaga, these monatomic elements are what augments the other benefits of providing nerve, joint, brain and psychic support. Sign up for our newsletter and receive a mystery gift, plus stay updated whenever we post new products or wellness-related information! Send us an email through our contact form and we'll get back to you within 2 business days.